The Toronto Maple Leafs completed a two-game sweep of Philadelphia with a 3-2 victory on Wednesday night, moving them within five points of the eighth-place Flyers in the Eastern Conference standings. This time, the Toronto Maple Leafs didn’t need overtime to keep their playoff hopes alive. One night after rallying from a 3-0 deficit for a 4-3 overtime win over the Flyers, the Leafs completed a two-game sweep with a 3-2 victory in Philadelphia, moving them within five points of the eighth-place Flyers in the Eastern Conference playoff race. Pavel Kubina, who got the overtime winner on Tuesday, broke a 2-2 tie 1:09 into the third period with a power-play blast from the right point that a screened Martin Biron never saw. 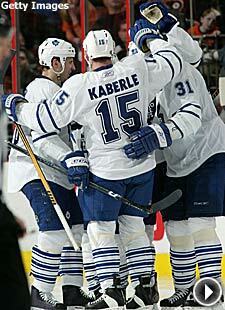 The Leafs won despite playing without captain Mats Sundin for the last two periods. Sundin left in the first period with a strained muscle, ending a nine-game scoring streak in which he piled up 16 points. Sundin is listed as day-to-day and should be able to play Saturday against Buffalo. ''He's the leader of our club, there's no question, but everyone stepped up when he was out and got the job done,'' White said. Toronto came out riding a wave of emotion from its comeback victory and took a quick 1-0 lead when White scored 3:55 into the game. Jeff Carter pulled the Flyers even when he beat Vesa Toskala between the legs three minutes later, but Alexei Ponikarovsky put the Leafs ahead again at 11:54 when he finished off a pass from Dominic Moore. Mike Knuble tied the score at 10:41 of the second period during a 5-on-3 advantage. It was the Flyers’ 78th power-play goal overall and League-high 42nd at home. The Flyers still have a four-point lead over ninth-place Buffalo, with Toronto, Washington and Florida — all of which won Wednesday — within five points of the last playoff berth. The Flyers fell to 16-14-6 at home. Losing the last two nights cost the Flyers a chance to pass seventh-place Boston and perhaps the sixth-place New York Rangers. Instead, they’re looking at a big group of challengers behind them. Florida is making its own late run for a playoff berth. The Panthers won their fifth in a row by scoring twice in the third period to complete a season sweep of the injury-wracked Islanders and move within five points of the Flyers. Defenseman Karlis Skrastins broke a 2-2 tie with 11:38 left in regulation when he picked off a poor clearing attempt and fired a slap shot from the left point past Rick DiPietro. The Isles’ goaltender was screened by defenseman Matthew Spiller — one of three callups from the minors who joined the team just in time for the game. Skrastins now has 23 NHL goals — six of them game-winners. It was his first goal since coming to Florida from Colorado at the trade deadline. The Panthers have 74 points, tying them with Toronto and Washington for 10th place. The Flyers have 79 after their loss to Toronto. The 13th-place Isles lost for the sixth time in seven games. Despite dressing a lineup that had eight players who’ve spent time in the minors this season, the Islanders showed much more energy than they had in Tuesday night’s 8-4 loss at Tampa. New York scored first when Bill Guerin finished off a 2-on-1 by beating Tomas Vokoun 28 seconds into the second period. But Kamil Kreps capitalized on a defensive mistake by the Isles and beat a helpless DiPietro on a 2-on-1 just 55 seconds after Guerin’s goal. Stephen Weiss put Florida ahead for the first time at 1:05 of the third period when his rebound shot from a sharp angle went off DiPietro's pad and landed behind him. But rookie Blake Comeau tied it at 7:18 with a power-play goal, beating Vokoun to the glove side with a wrist shot from the slot. Comeau had a chance to tie the game in the final minute, but backhanded the puck over the net with Vokoun out of position. Brett McLean then hit the empty net with 49 seconds remaining. Even without the services of captain Sidney Crosby, the Pittsburgh Penguins had their biggest offensive game of the season and moved into a tie for first place in the Eastern Conference with a 7-3 victory over the struggling Buffalo Sabres. No Sidney Crosby? No problem for the Penguins, who had their biggest offensive game of the season without two of their top guns and climbed into a tie for first place in the Eastern Conference. Crosby, coming off a two-goal game on Sunday against Washington in his third game back after missing 21 with a high ankle sprain, had recurring pain during the morning skate and didn’t play. He hopes to play Sunday against Philadelphia — but the Penguins are now 12-6-4 without him. But the Pens didn’t miss him. Seven Penguins scored: Tyler Kennedy scored the game’s first goal and added two assists, and Chris Minard had his first NHL goal. ''I think guys feel now that if we do have to play with a shortened lineup, they feel comfortable with what they can do and what they can produce,'' said goalie Ty Conklin, who made 29 saves. The victory gave the Penguins 87 points, tying them with Montreal for the top spot in the Eastern Conference. Pittsburgh also moved one point ahead of New Jersey for first place in the Atlantic Division. Conklin survived three Buffalo goals in the third period to beat the Sabres for the fourth time in as many tries this season — their first season sweep of the Sabres since Buffalo entered the NHL in 1970. Kennedy gave the Penguins a 1-0 lead 3:30 into first period with his first goal in 17 games. But Pittsburgh took control early in the second after Georges Laraque drew a five-minute major for elbowing Buffalo’s Nathan Paetsch. The Penguins had four good chances while killing the penalty, then got a goal by Jeff Taffe at 6:35 with the teams skating 4-on-4 after Buffalo’s Maxim Afinogenov was called for hooking. “That definitely was the turning point of the game,” he said. Sergei Gonchar made it 3-0 at 18:08, and the Penguins outscored Buffalo 4-3 during a wild third period. Daniel Paille had two of the Sabres’ goals. The Sabres, beginning to slide out of the conference race, are 1-4-2 in their last seven and couldn't gain ground on Philadelphia, which lost to Toronto but is still four points ahead of Buffalo. They were without five regulars due to injury. Carolina made it five wins in a row as Eric Staal had a goal and two assists in the first period and Cam Ward stopped 25 shots for his fourth shutout of the season. The Hurricanes scored all three goals during a 3:48 span midway through the first period to hand the Hawks their fourth consecutive loss. Chicago is all but assured of missing the playoffs for the ninth time in 10 seasons. Staal set up power-play goals by Eric Cole at 8:57 and Matt Cullen at 10:39, then made it 3-0 at 12:45 when he broke in alone and beat rookie Corey Crawford. Ward made one of his few tough saves midway through the scoreless second period, stopping Dave Bolland's one-timer from the right circle. He also stopped Patrick Kane from point-blank range late in the period and saw both Craig Adams and Jason Williams hit posts. “They still played hard,” Carolina coach Peter Laviolette said of the Hawks. “In the first period, fortunately, we had a couple of power plays and we cashed in on them. Three goals, a big goal by Staal, and we won 3-0. I don't think that they played like they were tired or like they played last night. I thought they played with a lot of urgency." The Blackhawks, 12th in the West and seven points out of a playoff berth, know they’re running out of time. "We have to take it one game at a time, and not worry about how far we are behind," defenseman Duncan Keith said. "We have to play our best game of the season against Columbus on Friday." The Anaheim Ducks won a team-record eighth in a row at home with a 4-1 victory over the Vancouver Canucks. Anaheim won its team-record eighth in a row at home and avoided a season sweep by the Canucks by beating Roberto Luongo three times in less than six minutes in the first period. The win gives Anaheim 88 points, one behind second-place Dallas and two in back of front-running San Jose in the Pacific Division. The Canucks had their three-game winning streak ended and remained in eighth place in the West with 80 points. They missed a chance to pull even with Calgary and Colorado atop the Northwest Division. The Ducks improved to 15-2-0 at Honda Center since Dec. 19. They’re tops in the NHL with 52 points at home. Anaheim jumped ahead when Todd Marchant came out of the penalty box, beat Luongo to a long pass thrown by Chris Kunitz and put the puck into the vacated net at 10:53. Travis Moen’s shorthanded goal, his first goal in 27 games and the first shorthander of his career, made it 2-0 at 13:17. 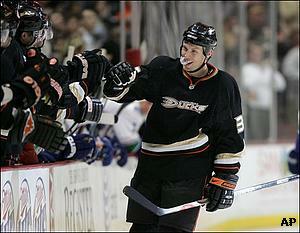 Rob Niedermayer gave Anaheim a three-goal lead at 16:49 when he knocked in a rebound after Luongo had made two saves. Vancouver’s Mason Raymond made it 3-1 when he beat rookie Jonas Hiller at 17:45 on a one-timer from the left circle, just six seconds after Anaheim’s Ryan Getzlaf went off for holding. It was the only shot to beat Hiller, who made 30 saves while giving starter Jean-Sebastien Giguere a night off. Doug Weight restored Anaheim’s three-goal lead with a power-play goal at 4:03 of the second period. Weight knocked down the rebound of Teemu Selanne’s shot and banged it past Luongo, who was replaced by Curtis Sanford after allowing four goals on 19 shots. “Any time you have a guy like Luongo between the pipes, it’s nice to get him out of there,” Weight said. The Canucks visit Phoenix on Thursday in a big game for both teams — the Coyotes are five points behind eighth-place Vancouver. "The good thing is that we play tomorrow night, right away," Luongo said. "We have to put it behind us."